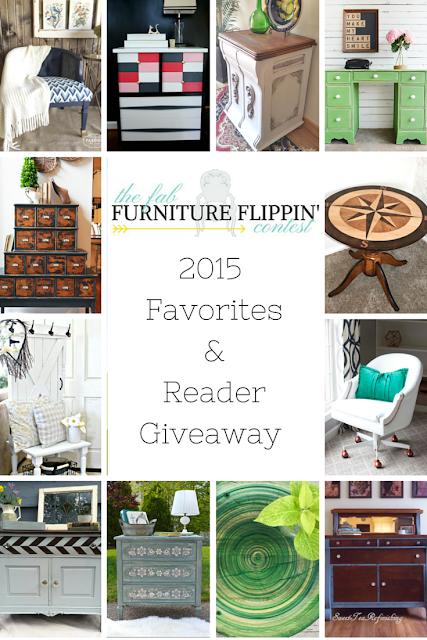 The Fab Furniture Flippin' Contest: December FFFC: 2015 Favorites & Reader Giveaway! December FFFC: 2015 Favorites & Reader Giveaway! Instead of having a new sponsor and new entries for December, there will be FOUR winners chosen from among the Judges Favorite Picks and 2nd & 3rd place entries from May to November. The four highest-voted entries will each receive a package of prizes from some of our generous sponsors! Four (4) quart packages of Milk Paint, one (1) quart of Extra Bond, one (1) pint of Antique Crackle, one (1) 5 oz. tin Daddy Van's Beeswax Finish, and one (1) 2 oz. tin of Daddy Van's Decorative Beeswax (Antique Brown or Shadow Black) from The Old Fashioned Milk Paint Co.
Four (4) pint packages of Milk Paint, one (1) pint of Extra Bond, one (1) 5 oz. tin of Daddy Van's Beeswax Finish, and one (1) 2 oz. tin of Daddy Van's Decorative Beeswax (Antique Brown or Shadow Black) from The Old Fashioned Milk Paint Co.
And best of all, the winners will be chosen by YOU, the readers! To vote, just hover over the image of the entry you like best and click on the little heart icon in the upper right corner. That's it! Voting closes on Saturday, December 19th at 11:59PM EST, so vote away and spread the word! 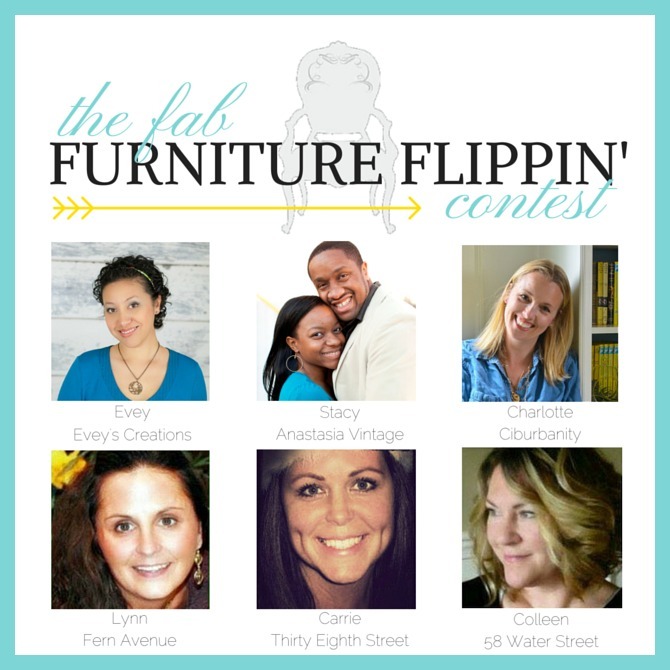 We also want to say a HUGE thank you to all of you for supporting The Fab Furniture Flippin' Contest and helping us to grow! It's been an awesome seven months and we couldn't be happier to have you as part of our community! And what better way to say thank you than to offer YOU some awesome prizes too?! 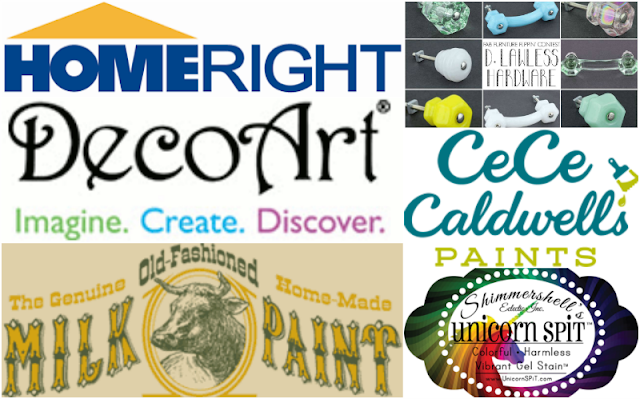 THREE very lucky readers will also win some great DIY products from our amazing sponsors! Three (3) pints Milk Paint, one (1) pint Extra-Bond, and three (3) sample tins of Daddy Van's Beeswax Finish (unscented, lavender and orange oil) from The Old Fashioned Milk Paint Co. Enter the giveaways below! Giveaways close on Saturday, December 19th at 11:59PM EST! Be sure to stop by and say hello to our awesome hosts this month too! We'll be posting throughout the month about some of our favorite sponsors! What a fabulous opportunity! My favorite part of the season is watching the kids faces on Christmas morning. My favourite sponsor was MINTED, loved the fabric it was a dream to work with and was so gorgeous! Oh my oh my what a fantastic chance for a great prize package for the participants & the readers! Thank you so much to all of our amazing sponsors...we could not do this without you!! so many great projects... Christmas is about family! It's been fun participating in this contest! So much talent! My favorite part of the season is Christmas Day with my family! Im mot sure what my favorite wpuld be. They have all been fun and fab. My favorite sponsor was minted, but it was a tough decision because they were all so awesome! My favorite part of the season is the holiday/festive feeling! I'm not sure how to describe it, it just feels different than other seasons. The food is good too! Can I say I love DIY (even though that's not really one of the "themes")? What a collection of talent! The themes are brilliant at highlighting them all! Amazingly talented bloggers to pick from, it was hard picking just one! A HUGE thank you to all of our generous sponsors! What a tremendous group of talented and creative individuals to pick from! Such great projects and prizes. My favorite thing about the holidays is spending precious time with family and friends and holding the love of Christmas in my heart. I really loved the November contest and Minted as a sponsor! My favorite part about the holidays is seeing the magic from my children's eyes!!! What a hard choice between all the amazing projects and what great prizes to be won by all! Favourite part of the holiday season is giving to others. my favorite theme was the fabric in Nov! my favorite sponsor was minted! best part of the holidays is seeing people's faces when they open a special gift! What an awesome give away! Love all the pictures of the furniture! I just was looking to see the winners and i think i won the 3rd one. I never got a notification. Can i still claim it?